The noun is the word we use to name objects, people, countries, and so on. Like articles, nouns have gender (feminine or masculine), and number (singular or plural). These features must always match the features of the article. 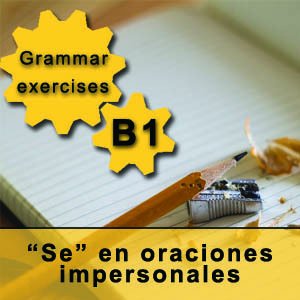 In this exercise, we are going to focus on the study and practice of the singular and plural nouns in Spanish. First of all, let’s define what singular and plural mean. A singular noun refers to one element (one object, one person, one animal…), and a plural noun refers to two or more elements (several objects, persons, animals…). For example, “casa” (“house”) is a singular noun, while “casas” (“houses”) is a plural noun. To help you practice with singular and plural nouns in Spanish we have put together an exercise that we have divided in two parts, the first part is theoretical, to explain how we form the plural in Spanish. The second part are exercises to practice. – Words ending in -e: For “el coche” (“the car”), the plural is “los coches” (“the cars”), for “la noche” (“the night”), the plural is “las noches” (“the nights”). – Words ending in –n: “la canción /las canciones” (“the song/the songs”). – Words ending in –l: “el papel /los papeles” (“the piece of paper/the pieces of paper”). – Words ending in –d: “la pared/ las paredes” (“the wall/the walls”). – Words ending in –y: “la ley /las leyes” (“the law/the laws”). – Words ending in –r: “el motor/ los motores” (“the motor/the motors”). 3) Nouns ending in -s or -x need a special explanation. If the word is “aguda” (that is, the accent of the word falls on the last syllable) the plural is formed by adding -es. For example: “el compás /los compases” (“the compass/the compasses”). However, if the noun ending in -s or -x is NOT “aguda”, they do not change in plural. For example: “el viernes/los viernes” (“the Friday/the Fridays”), “el virus/los virus” (“the virus/the viruses”). 4) Pay special attention to words ending in -z. These words form their plural in -ces. Some examples: “la nariz /las narices” (“the nose/the noses”), “el lápiz/los lápices” (“the pencil/the pencils”), “la voz/las voces” (“the voice/the voices”). And, of course, do not forget that the articles of singular and plural nouns in Spanish must match the noun. Unlike English, that keeps “the” no matter the gender and number of the name, in Spanish the article and the noun must carry the same gender and number. For example: “la casa/las casas”, “el coche/los coches”. 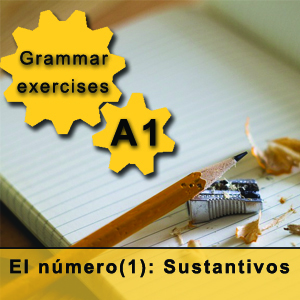 Now that you know the basic rules to form the plural of nouns in Spanish, we encourage you to complete the exercise and then compare your answers with the solutions that can be found at the bottom of the page. We hope that your practice goes well and we wish you the very best of luck with your studies. And, if you want to go deeper in the study of this language, visit our Spanish school in Madrid.